Only available for residents of Quebec and Ontario. 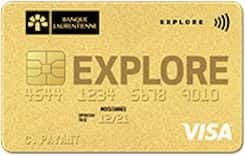 Get 2,500 points with your first purchase and 8,500 points when you charge $1,000 to your account within the first 3 months. Refer to site for terms and conditions. For Ontario/Quebec residents only. This CAD currency 83 is issued by Laurentian Bank and runs on the VISA Network. The purchase interest rate for this credit card is: 19.99 percent annually and the transfer balance interest rate is: 21.99% per year. Also the cash advance rate is: 21.99% per year. Travel cancelation is Included for this credit card and also travel accidents are Included.